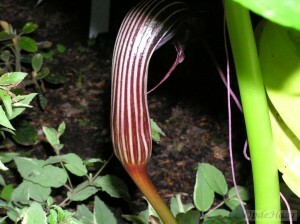 Aroid is the common name for members of the Araceae family of plants, sometimes know as the Philodendron or Arum family. 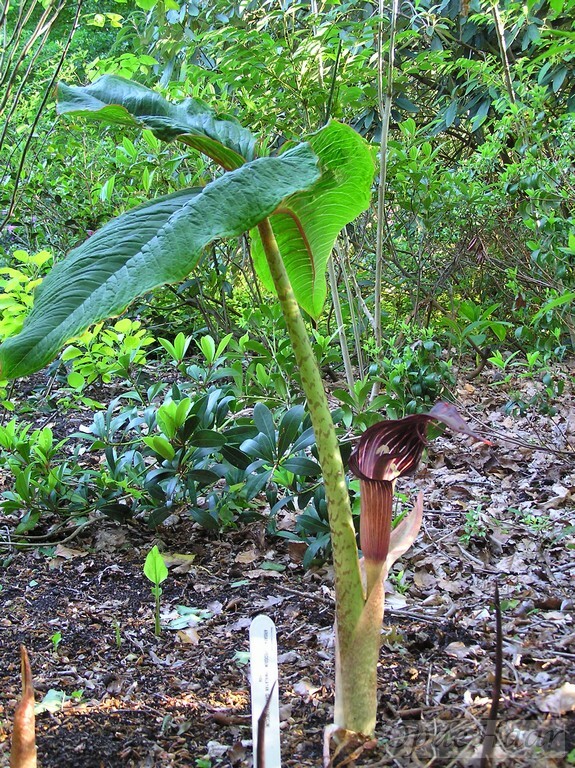 The sometimes beautiful and sometimes bizarre combination of spathe and spadix know as the inflorescence, and sometimes referred to as a “flower, is a distinguishing feature of all aroids. Arisaema sikokianum is an unusual plant. The Dutch name of “Jan in the pulpit” is very descriptive. It flowers in April to May. 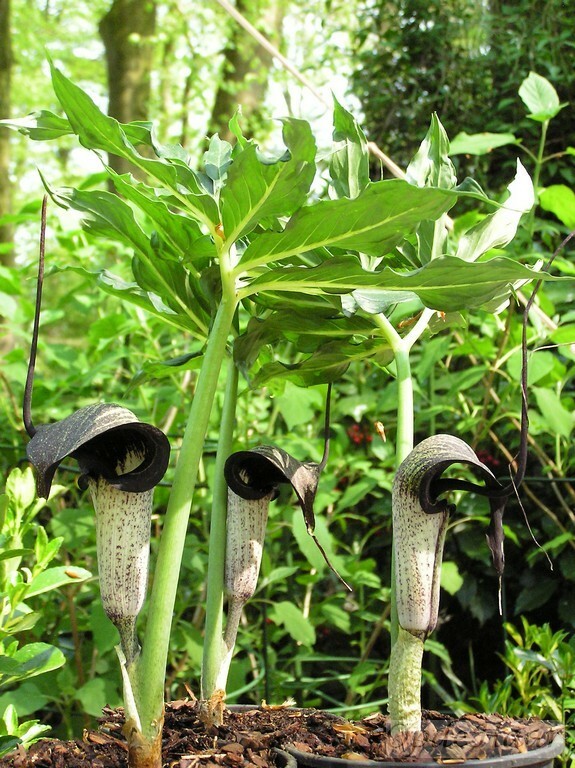 As is easy to imagine by just looking at the few photos here, it doesn’t take too much arm twisting to start collecting arisaema! Since about 2005 they are starting to appear more frequently in the better garden centres and nurseries although prices for choicer varieties such as Arisaema sikokianum certainly don’t come in the “cheap” category. 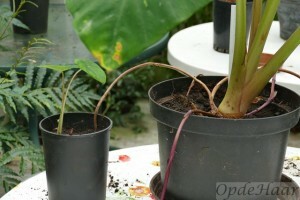 To introduce you to a good Dutch supplier, may I suggest that you click onto www.perkgroen.nl. 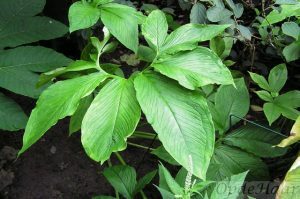 Here at Op de Haar, I’ve tended to focus on the varieties which produce really big leaves once the flowering is finished and which can also be left in the ground for the winter. Moving on to my other giant aroids the garden, Arisaema speciosum “Himalyan Giant”, I planted them rather close to the house in a shaded bed about 3m from the window of a room where we have a TV set. In short, in a place where I unfailingly look at them practically every day. 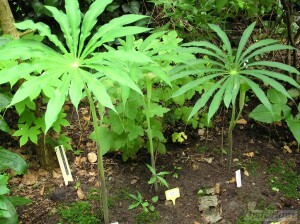 These really were an experiment because the plants are noted in the literature as being at best half-hardy. Arisaema speciosum hails from the central/eastern Himalaya and again it came through the winter of 2008/2009 without any problems. 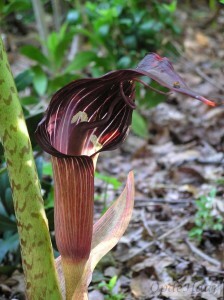 This arisaema emerges from the ground very early in the spring to delight the olfactory senses for 24 hours and then forms individually leaved stems -the latter beautifully mottled – which die back in the late summer, September-October, as a composite, green seed head forms from the lower part of the stem. 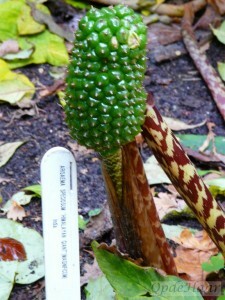 This head ripens to a red-orange colour. In 2008 I brought this seed head into the kitchen in November and finally subjected it to a good rinse in a sieve around mid-February when the capsules felt a little soft. Many of the seeds were germinating and soon grew away after planting in seed trays. 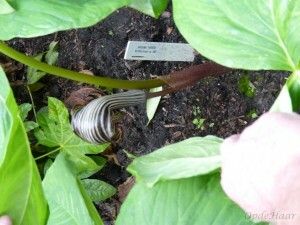 As I said, the mother plants are outside and the only frost protection I attempted was to leave a covering of autumn leaves on the earth until around the end of February. 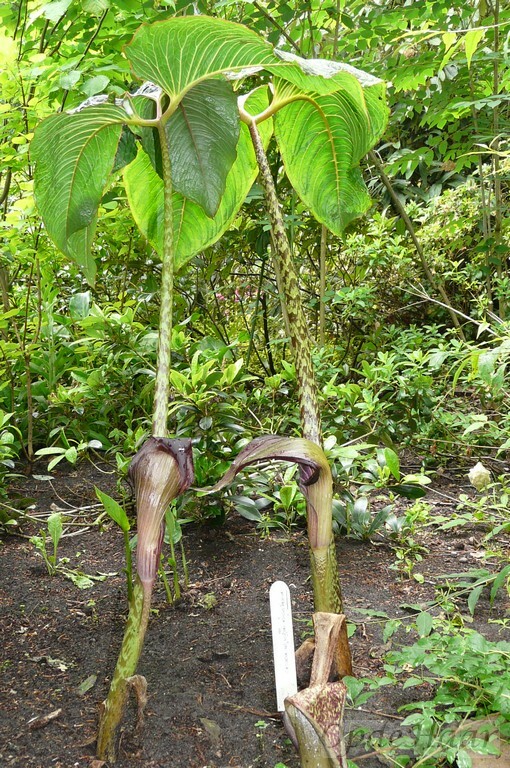 The winter of 2008/9 ended with a prolonged cold spell and, without special protection, I found that Sauromatum nubicum, seemed to suffer no setbacks. 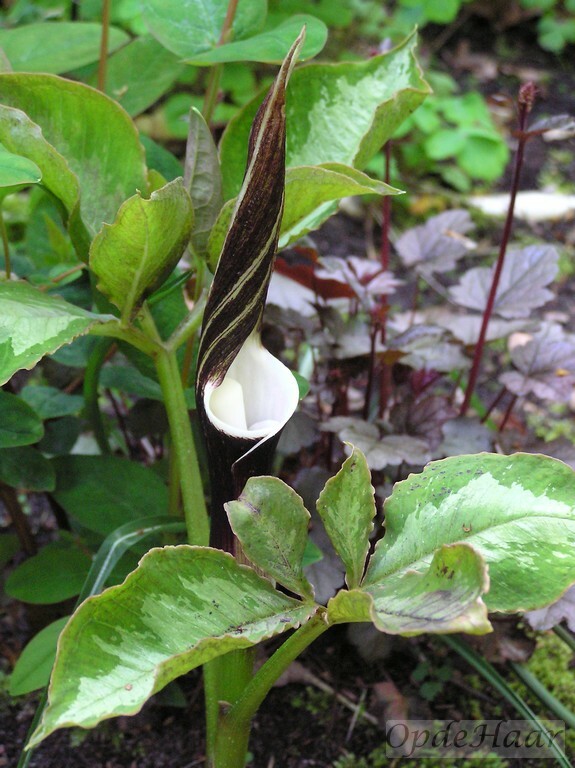 Sauromatum or Typhonium nubicum is in a spot in the garden which seems to cool excessively during clear winter nights but the two clumps of plants pushed out of the soil in mid-March as if we had just had another very mild winter. 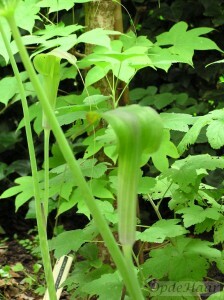 This location also gets full sun in summer and can get bone-dry. 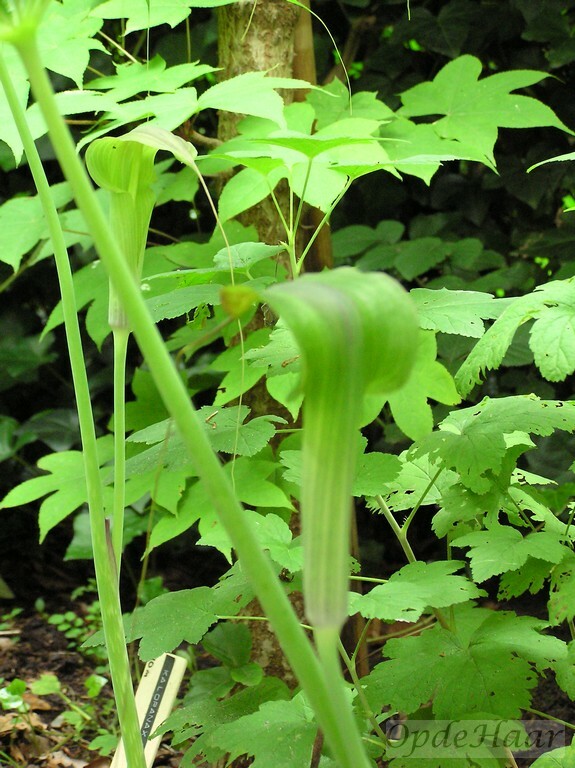 So, here you have an arisaema variety which manages very nicely in positions which would literally be fatal to many of its woodland brothers and sisters. 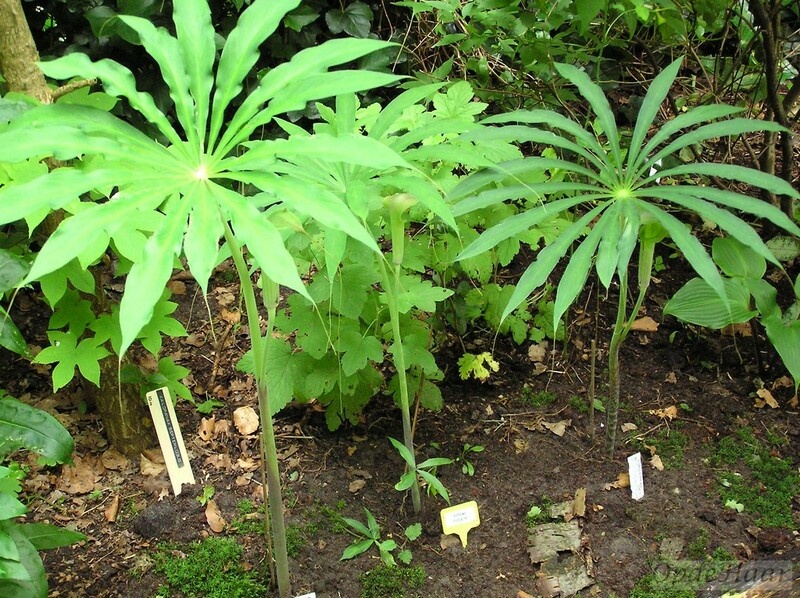 Sauromatum nubicum soon forms a good clump with large-leaved plants up to 1m high – a sort of hosta on growth hormones! 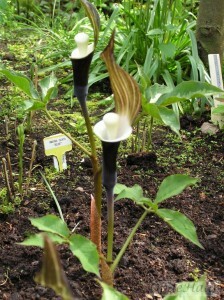 It can be easily grown from seed which pushes out of the ground as a sinister, black sausage-like lump after the plant has died back for the winter. 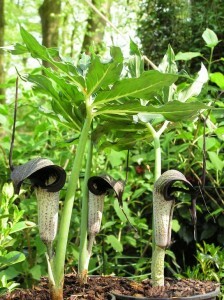 If you don’t watch carefully, the black colour is such a good camouflage against the earth that the composite seed pod can just collapse and tiny plants can then appear much in the same way that clusters of helleborus seedlings appear beneath the mother plant. Similar lessons apply – if you don’t want to risk the seedlings being smothered out, transplant them into pots as soon as you can. 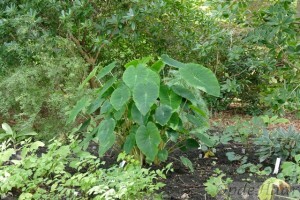 A preferred and controlled alternative is to plant the seed into trays and go from there . 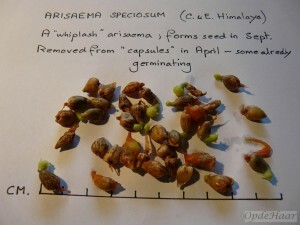 A technique which works very well for me involves washing the pulp off the ripe seed heads in a sieve and sowing the 2mm diameter seeds onto seed/potting compost under a layer of vermiculite; germination is as good as 100% in spring. In fact, I had so many of the things in 2008 that even after selling and giving them away I have planted out several clumps around the woods to see how they develop in contrasting environments. 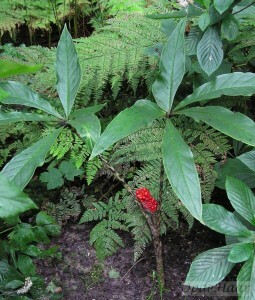 My original plant came from De Groene Toko nursery here in Beesd, The Netherlands which I have just referenced and he first obtained the plant by mistake in a shipment as his website reveals. 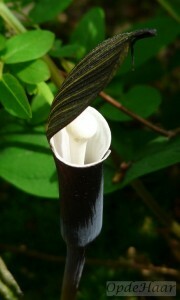 It apparently originates from the cool foothills of the Himalaya. From the point of view of the gardener, it is a spectacular plant, tolerant of sunny and dry conditions, easy from seed and winter-hard. Other interesting aroids are: Arisaema candidissimum, Arisaema costatum, Arisaema erubescens, Arisaema fargesii, Arisaema galeatum, Ariseama griffithi, Ariaema nepenthoides, Arisaema ringens, Ariasaema sikokianum, Arisaema speciosum Mirabele en Arisaema thunbergii. 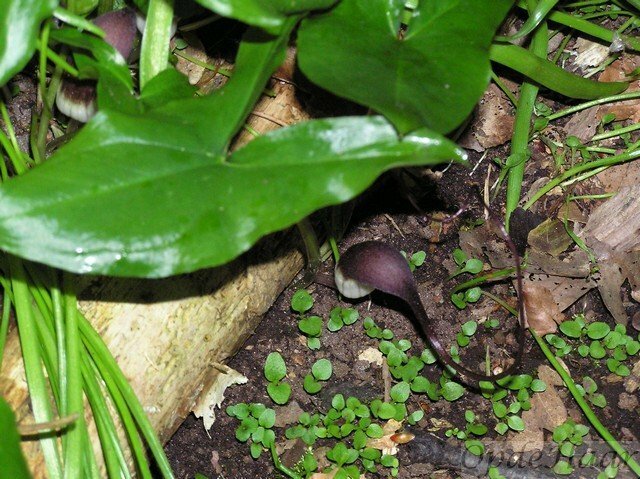 In contrast to the large leaved aroids, this tiny weirdo originates from Italy and Spain. At first sight you see only a low ground cover of arum-like leaves that slowly spread over the years and emerge each spring and disappear as summer advances. Only when you lift a leaf and are confronted by the flowers hugging the ground does the reason for the plant’s name become clear. 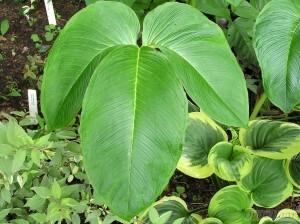 Although Colocasia esculenta or ” taro” has long been a staple root vegetable in tropical and sub-tropical parts of the world, it’s distinctive large leaves have an undoubted decorative value in the garden and over the years, numerous hybrids have appeared with a variety of leaf patterns and colours. 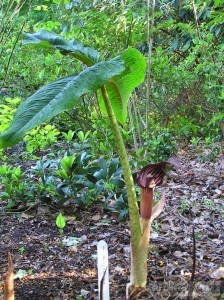 An article by Dennis Carey and Tony Avent of the Plant Delights Nursery ( Raleigh, North Carolina ,USA) entitled ” Cool Colocasias – Elephant Ears for Gardens” gives a comprehensive introduction to these members of the Aroid family as decorative garden plants – http://www.plantdelights.com/Article/Colocasia-Elephant-Ears . 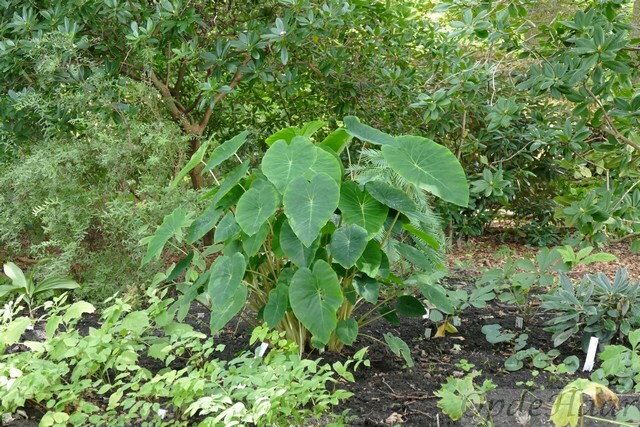 Some years ago, Kentucky-based Brian Williams decided to start a breeding programme to try and develop Colocasia varieties with improved winter-hardiness and took a clone from a 1991 mountain collection in Yunnan, China for use in his programme. 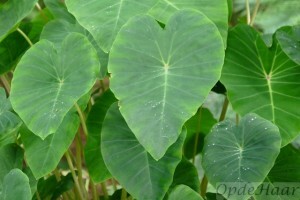 He introduced this in the USA under the name Colocasia esculenta ” Pink China”. 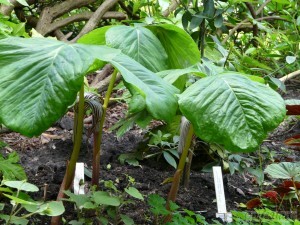 “Pink China” is now fairly widely available and I got a plant in 2012 from Hans Prins (Kwekerij De Groene Prins) here in The Netherlands. Hans had a plant outside which he forgot about and this came through a notorious week of temperatures descending to -18 deg C after a previous mild winter in early 2013 which gives an indication of what “Pink China” can withstand. 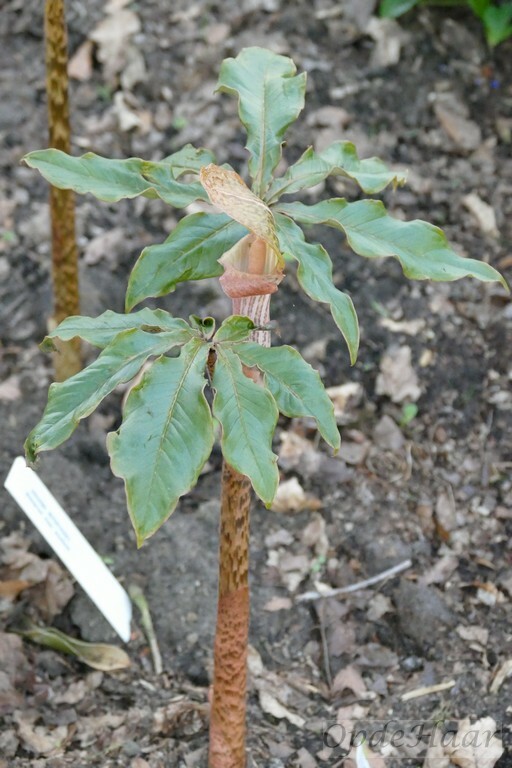 The literature is still understandably cautious on the question of winter-hardiness but all indications are that if you successfully over-winter exotics such as Musa basjoo and Melianthus major, then you will be OK with “Pink China” here in The Central Netherlands. “Pink China” thrives in moist, rich soil and will happily succeed in light shadow as the photo of our plant illustrates (August 2014). 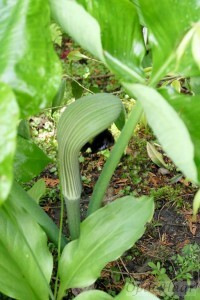 It soon forms a clump with leaves up to about 120 cm high. 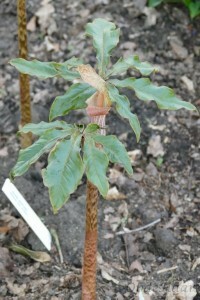 The pink stems are an obvious characteristic and I have the impression that one maybe sacrifices some intensity of colour by planting in shade. 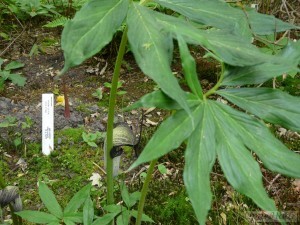 “Pink China” spreads by sending out pink, over-ground runners which make it both easy to control and propagate. 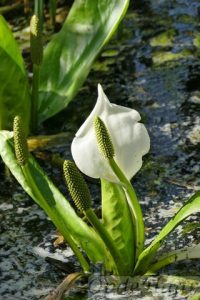 “Pink China” can indeed be grown with it’s roots submerged in water and then also be exposed to full sun but this pond side use will probably dictate that it will need to be dug up and the root removed to a (frost-free) storage place to avoid rotting in the winter. 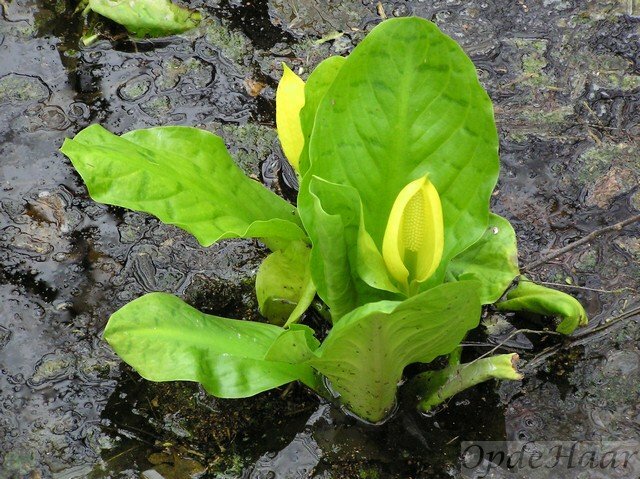 That said and thinking of another aroid family member which seems content both on land and in/under water – Zantedeshia aethiopica – it might be interesting to explore the possibility in milder regions of over-wintering “Pink China” with the root underwater in a pond. 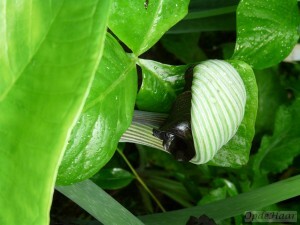 (I’m happy to be shot down by an expert on this idea but “fools rushing in” do occasionally meet with success !) 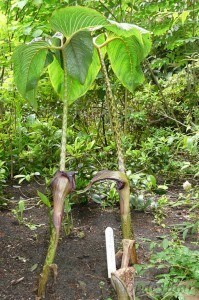 As I said, the key to growing colocasia successfully in the garden is to feed them well and be sure that they do not dry out. As owners of a large woodland garden, we will be trialling “Pink China” in various shady locations and it will be interesting to see if we have something that can give giant hostas such as ”Empress Wu” a run for their money. 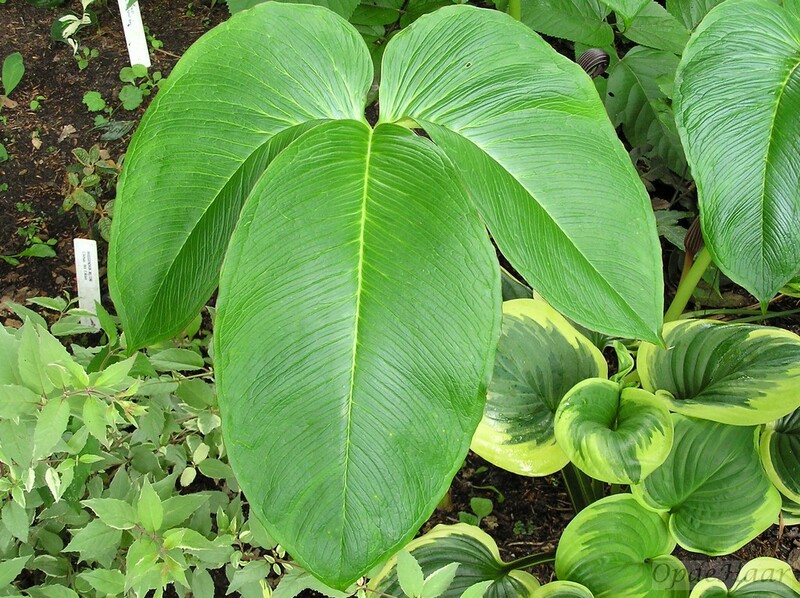 All we need now is for someone like Brian Williams to start producing fancier leaved variants while keeping or enhancing winter-hardiness of “Pink China”. Before leaving the topic of winter-hardy colocasias, it is interesting to note another recently introduced Chinese variety which is said to have good hardiness – Colocasia gaoligongensis. In Europe, this can be obtained from aroid specialist Ben Candlin – www.bencandlin.co.uk – Ben’s website provides information on a wide range of aroids including colocasias. People wishing to take the love affair to very deep levels can do no better than get hold of Guy and Liliane Gusman’s book “The Genus Arisaema”, Timber Press, ISBN 3-904144-91-X. 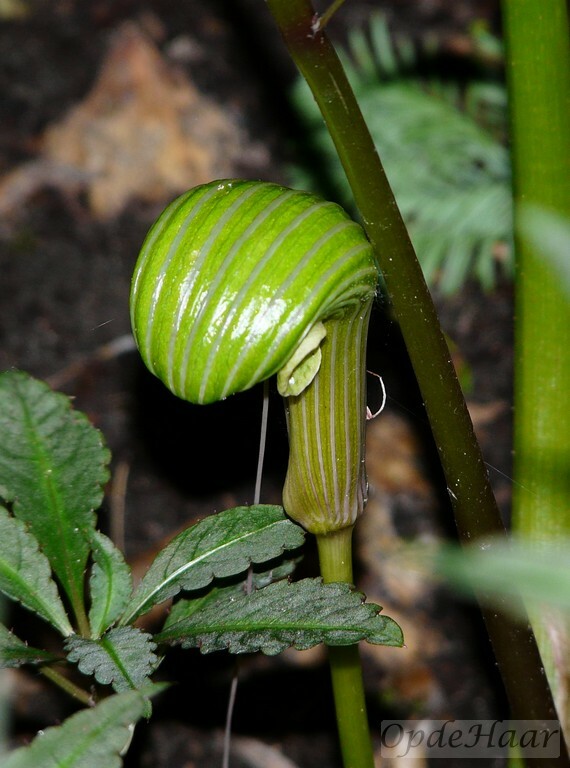 For a complete reveiw of the field, Deni Bown’s second edition of “Aroids – plants of the arum family” from Timber Press, 2000, ISBN 0-88192-485-7 is an excellent and very readable work. 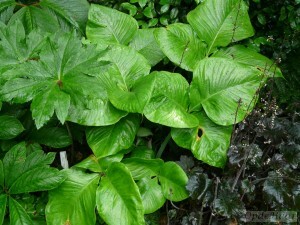 Lysichiton camtschatcensis is the somewhat more delicate Asian species with a white spathe and somewhat lighter green leaves which are seldom larger than 80 cm long and do not have dark markings seen on L. americanus. 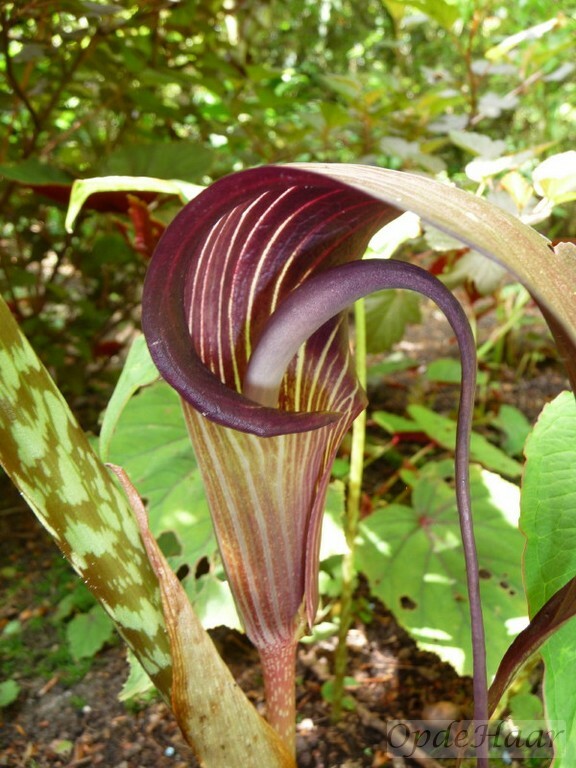 The skunk-like odours are also considerably less intense than those of it’s American cousin. 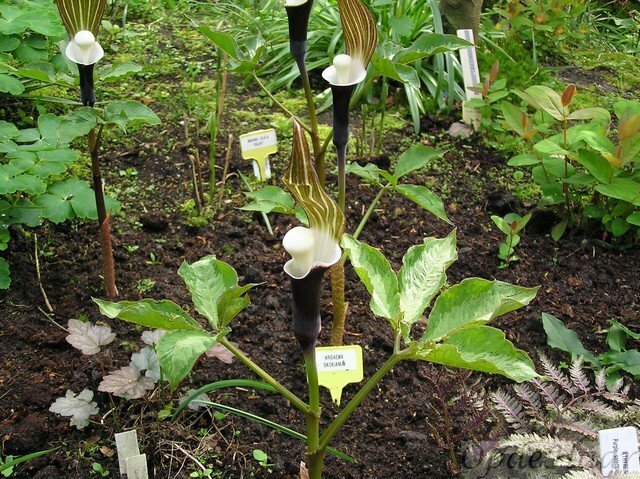 It is found on the Asian shores of the Bering Strait down to Northern Japan and is also readily available from garden centres. The two wild species of Lysichiton are closely related and will form hybrids which are collectively referred to as Lysichiton x hortensis. Generally speaking, it is difficult to distinguish these from the parents but dedicated selection can lead to improved garden varieties and notably Beth Chatto’s nursery in UK is offering a sterile hybrid with a large, white spathe which, while decorative, avoids any problems associated with spreading seeds. 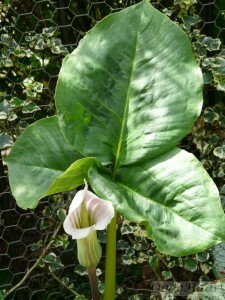 Searching the Internet suggests that the demand for these improved hybrids currently outstrips supply! The following links are a good start for the enthusiast interested in Aroids. 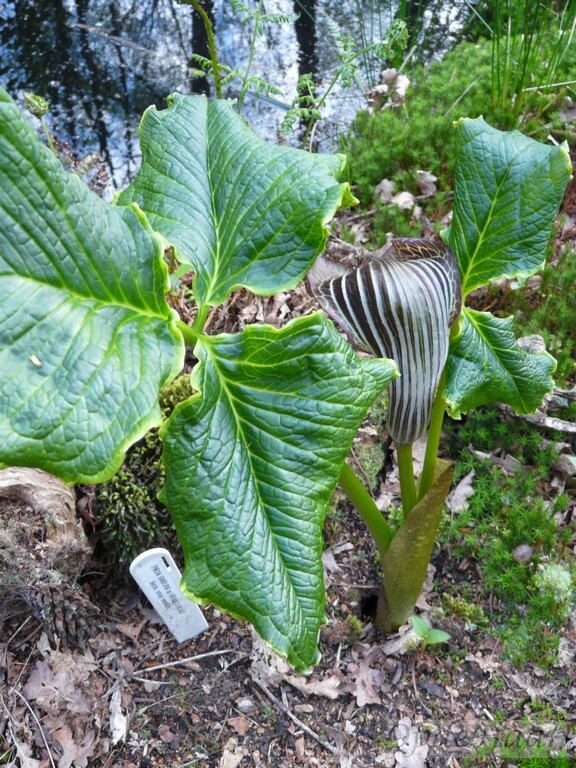 For those who wish to make a deeper study Guy and Liliane Gusman’s book “The Genus Arisaema” from Timber Press, ISBN 3-904144-91-X is a good start. 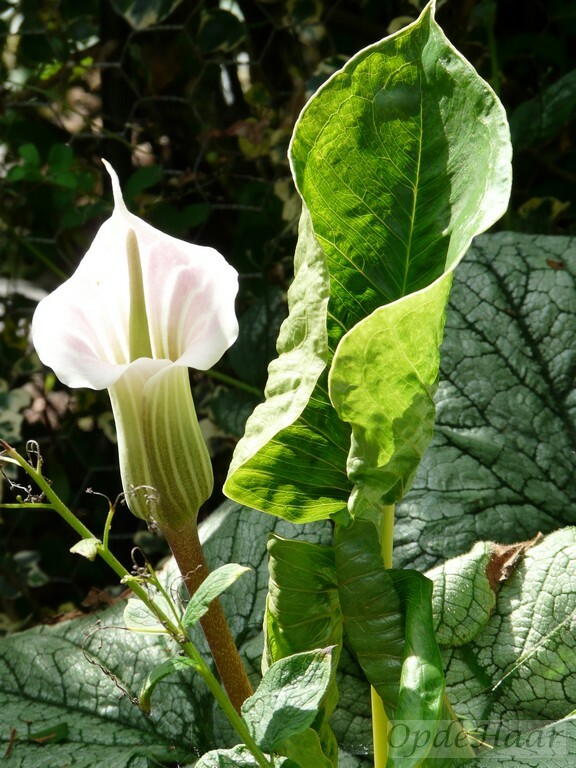 Also from Timber Press is Deni Bown’s “Aroids – plants of the arum family,” ISBN 0-88192-485-7, that gives a readable overview of the subject.